En Tout Cas championship tennis balls - still in great condition after more than 50 years! 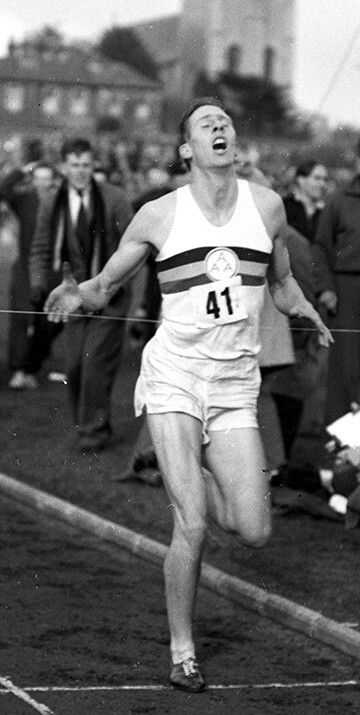 Roger Bannister, later Sir Roger, became the first man to break the four-minute mile at Iffley Road, Oxford in May 1954. The cinder track was built by En Tout Cas. Bob Shepherd, the first generation of the Shepherd family to be involved with En Tout Cas, helped to build the track. En-Tout-Cas is the oldest and best known of all artificial tennis court surfaces. The original En-Tout-Cas surface was first manufactured in 1909. Commander GW Hillyard, secretary of the All England Lawn Tennis Club, Wimbledon and captain of the Great Britain tennis team, had seen artificial courts made from crushed ant heaps in South Africa. He asked Claude Brown, the manager of a coal merchants and a brickyard in Leicestershire, if he could produce something similar. Claude soon came up with a top-quality court made from crushed brick and burned shale. A prototype court at the Commander’s home in Thorpe Satchville proved to be an instant success and orders rolled in from some of the country’s best players. These courts became known around the world as En-Tout-Cas - a phrase Claude appropriated after a guest at one of his tennis parties showed off her En Tout Cas – an all-weather parasol from France. The earliest synthetic tennis court surfaces had been slow to drain and dry. Claude’s genius lay in the idea of making courts, from ground-up stone and brick, that were quick to drain. By 1914, the new En-Tout-Cas red clay tennis courts were being installed in their hundreds for the wealthy and for leading clubs. After the war, the company thrived. 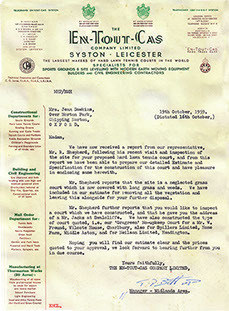 By the mid-1920’s the company had agents throughout Europe, Scandinavia and North America. En-Tout-Cas’ London offices were located in Harrods and in Fortnum and Mason. An En-Tout-Cas tennis court was as essential an adjunct to an English country house as a Rolls-Royce. Claude Brown was appointed Tennis Court Maker to King George V. By the mid-1930s, there were ten En- Tout-Cas courts at Wimbledon and the company’s courts were being used for the Davis Cup and the French Open. North American clients included Edsel Ford, H F Du Pont, S R Guggenheim, J Pierrepoint Morgan and two members of the Vanderbilt family. During the second world war, En -Tout-Cas contributed to the war effort by building and repairing airfields for the RAF. As En-Tout-Cas entered its second century, the ownership of the business came full circle through the involvement of two families of tennis court builders. Claude’s son Ronald succeeded him before handing on to his own son Colin. Today, En-Tout-Cas Tennis Courts is owned and run by Rory Shepherd. Rory learned his trade with En-Tout-Cas in the early seventies. Rory’s father Robert ‘Bob’ Shepherd began work for En-Tout-Cas after the end of the Second World War. Bob answered an advert for a tennis court constructor, persuaded his brother Fred to teach him to drive – in a couple of hours – and then drove to Leicester where he duly secured the position after an interview. After 1945, the combination of enormous amounts of rubble and brickwork and the large open spaces left by bomb damage in the centre of British towns and cities made for an ideal scenario for the speedy development of shale tennis courts and sports amenities. This provided sports and leisure facilities for the population and improved the country’s battered urban landscape. En-Tout-Cas’ standing was such that after the crippling winter of 1947, Claude Brown led the civil engineering industry’s delegation to 10 Downing Street to organise the national response to the crisis. In 1948, the Olympic Games were staged in London, at very short notice. The main venue was Wembley Stadium, which had no athletics track. With just eight weeks to the go to the opening ceremony, En-Tout-Cas was asked to provide a world-class running track. The company came up with a completely new cinder formulation and completed the track with just two days to spare. Through the 1950s, En-Tout-Cas went from strength to strength. The company installed cinder tracks all over the world until the introduction of faster plastic tracks at the 1968 Olympics rendered the tracks obsolete. In the sixties, En-Tout-Cas received the Queen’s Award for the work it did on a massive programme of land reclamation around Stoke-on-Trent. En-Tout-Cas was sold to Crest Homes and Bob Shepherd was promoted from Inspector to General Manager of the whole UK. En-Tout-Cas developed new products such as Tennisquick, a porous concrete tennis court, Pladek an acrylic-painted porous bitumen macadam tennis court and Savanna, a sand-filled polypropylene synthetic grass court surface. In 1977, Virginia Wade won Wimbledon and, that year, presented Bob with a Wimbledon centenary plate. Three years earlier, Rory had joined En-Tout-Cas. He had already spent his school summer holidays building tennis courts in France for the company. He went on to complete the company’s apprenticeship scheme before taking a National Diploma in construction. He was also part of the team that built the running track and tennis courts for the African Games in Ghana in 1977. Two years later, Rory left to start Anglia and Midland Sports and Bob retired. Anglia and Midland prospered, and Rory bought En-Tout-Cas Tennis Courts in 2010, to continue a family relationship that has now spanned more than 65 years and to restore the old En-Tout-Cas ethos that “quality comes first” to this iconic British institution, in time for its second century. Rory’s son Tony Shepherd has been brought up visiting tennis court sites and working on them in his school and University holidays. The players' tunnel at Old Trafford for the 1996 UEFA Championhips. Choice of Champions - En Tout Cas courts were used for the Davis Cup, and the French, British and Canadian Championships. From 1958 - Bob Shepherd's letter to a customer setting out terms and conditions for the construction of a new tennis court. 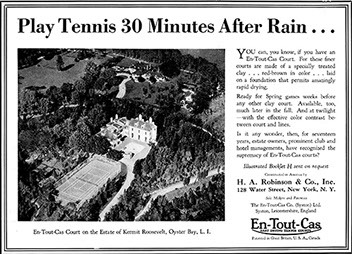 A print advert from a US magazine in the nineteen thirties, advertising the all-weaher capabilities of En Tout Cas tennis courts. The court was built for Kermit Roosevelt, son of US President Theodore Roosevelt. The house had been use as the President's summer white House. Centre court tickets for the first Friday in June, 1989 - price just £18. Brass court plate - with royal warrants for the UK and Sweden.